Electrical driven vehicles provide an alternative mobility concept, which is independent of fossil fuels. Nowadays the range of those vehicles is significantly lower compared to vehicles with combustion engines. The reasons for this may be found in inefficient vehicle components, such as battery, control devices and air conditioner. In addition, a huge share of the constrained energy amount needs to be used to fulfil operators’ requirements, in terms of driver comfort and vehicle performance. 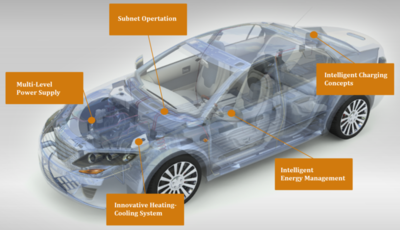 In order to increase the range of electrical driven vehicles, the energy demand of the involved components has to be reduced, the efficiency has to be increased and the energy management has to be optimised. Objectives of the ReelaF research project are the development of intelligent charging concepts, skilful energy management of the on-board power supply network and the development of an innovative heating/cooling system. The institute of power electronics and electrical drives focuses on the development of innovative converter concepts for electrical chargers and on-board DC/DC-converters. All these objectives share one common aim: The range and the efficiency of electrical driven vehicles are to be increased without effecting operator demands for comfort. Overall a range extension of approx. 20% is expected. Meeting these objectives will provide a significant contribution for the acceptance of electrical driven vehicles and the reduction of CO2 emission.